But, I have never heard a Republican answer it well. After America's tragedy last night, the answer may come too late. #1. You have to be alive to have any other rights: The Right to Life. #2. You have to have Liberty before you can Pursue any kind of Happiness: The Right to Liberty. #3. Life and Liberty make the Pursuit of Happiness possible: The Pursuit comes last. These rights come from God. Government can only protect or violate them. It doesn't give or take away. America's government was instituted to secure our rights by protecting the individual from tyranny. Obamacare assaults our rights to Life, Liberty, and the Pursuit of Happiness. Life: Obamacare will most certainly fund abortion with the tax payer's money. Only those willing to be deceived (Bart Stupak, et. al), cannot see that. America has crossed many lines, but not this one--until last night. Healthcare is the only “right” I’m aware of that requires police and bureaucratic powers to force it upon us. For the first time in history, Washington now commands every citizen to purchase health insurance--or else. Or else seventeen thousand IRS agents will come threatening fines, or worse. If a citizen cannot see that this is oppressive, question his ability to see the self-evident. Pursuit of Happiness: Inside this right is the right to property. Obamacare undermines that right by higher taxes. For examples, taxes on investment income--newly acquired property. So much for prosperity and social mobility. Also, inside this Pursuit, is the desire for quality healthcare. It is axiomatic that government controlled healthcare will decrease quality. This won’t make anyone happy: from the unborn to terminally ill. These are the beginning of our complaints. Because Obamacare fails to secure our rights (indeed, it undermines them) we should repeal it immediately--and dismiss anyone from office who would force it upon us. Below are 84 posts distilled from the short life of this blog. I may blog again one day, but until then you are welcome to read these book reviews, reflections on issues, conference notes, and other items. If you'd like to leave a comment, please feel free to do so. I will get them. James W. Sire, author of The Universe Next Door has written another worthy volume entitled Why Good Arguments Often Fail: Making a More Persuasive Case for Christ. This book is an enjoyable read without a lot of the heavy technical work I have recently studied (more on the heavy stuff in a moment...). The rest of the book attempts to answer the question. I liked this book a lot. Part One, a discussion on “Common Logical Fallacies,” was fun to read. Chapter 2 is a short, humorous story by Max Shulman called “Love is a Fallacy.” This chapter was worth the price of the book. The “punch line” of the story made me laugh out loud. Every pastor should read Part One of this book. I’m afraid a lot of preaching today includes the logical fallacies Sire mentions. It is a vitamin for one’s credibility. Part Two addresses “Good Arguments that Often Fail.” Mr. Sire reminds the reader that arrogance, aggression, and cleverness do not serve the cause of apologetics. Neither should a Christian misread his audience. This section reminds us to pay attention to whom we are talking! Ask yourself, “Where are they in their journey?” Communicate to people “where they are.” The author also discusses evolution, relativism, and the issue of moral blindness. I appreciate the author’s work but have to critique his method on a couple of points. First, I feel that he concedes the issue of creation too quickly to the majority opinion. In fact, Mr. Sire suggested that we not address the questions of creation/evolution if we can help it. On one hand, I respect Mr. Sire’s concern for thoughtful reflection on the issue of creation/evolution. I understand that influential people, like Francis Collins of the Human Genome Project (not mentioned in this book), are theistic evolutionists and many people will not listen to apologists who are not. On the other hand, I feel that Mr. Sire is willing to give away Genesis 1-3 too soon in order to get a hearing for Matthew, Mark, Luke, and John. There is something wrong with this position, although I am at a loss of words to articulate my concerns. Also, in all of this book and its terrific bibliography, I found no reference to the transcendental argument offered by Van Til, Bahnsen, and others. I understand that much of the work can be heavy and difficult. I have had to make several passes through the material to start getting it into focus. And I plan a few more excursions--because I have not yet reached the summit. Anyway, I like Why Good Arguments Often Fail and recommend that you read it. College students, especialy, should have it on their shelves. Mr. Sire has done well for us in writing this book. 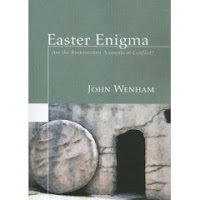 This Easter season, I read John Wenham’s book Easter Enigma: Are the Resurrection Accounts in Conflict? It was one of the most enjoyable books I’ve read in a long time. Chapter One lays out the map of Jerusalem and the surrounding area. Mr. Wenham does a fine job describing and mapping out the locations of the story. This is essential to understanding the flow of the Easter narratives. The rest of the book discusses not only the key characters in the history of Christ’s resurrection accounts but also all the Resurrection appearances listed in the Gospels and 1 Corinthians 15. The author shows how each narrative dovetails with the others. He potentially solves the “problems” and “discrepancies” from one account to the other. The point is not that Wenham’s work is absolutely convincing. The point is that he highlights explanations that undermine the skeptics and encourage the believers. The reader sees the the nature of the case. The reader sees how fast events occurred that morning and how the disciples responded and informed each other of them. The disciples may not have been in one location--and the "comings" and "goings" were breathless. The Resurrection narratives are not contrived. They reflect the shattering effect on unbelief and despair that Christ's resurrection obviously had. The benefit of Wenham's book is that we see how it could have been. And in seeing how it could have been, we need not feel cornered by skeptical answers that refuse any explanation but unbelief. I have had a question about these matters since I was in high school (many moons ago), and I enjoyed a more complete answer than I’ve seen previously. I think you’ll like the book. 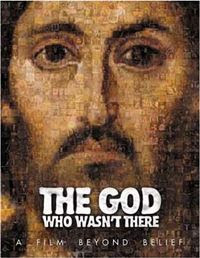 Last week, I watched the video The God Who Wasn't There. A family in our church had asked me to watch it, and--since I've been concerned for quite some time with helping young people engage the issues at hand-- I took the time to do it. "It was a movie designed to destroy the viewer's faith in or regard for Christianity. As I watched it, I found myself laughing at the totally empty and dishonest attacks that were dressed up as "arguments" against God and Christ. But as the video continued, I found myself feeling very sorry for the producer of the film. His misguided method of thought led him to a personal denial of Christ. He made the movie to make Christians feel ashamed of the gospel--like he was. But all he could muster was a propagandistic hit-piece made of masterful accusations and faulty associations. Logically, his movie skipped and popped like a scratched record from the old days. That's exactly how I felt when I watched this movie. It mechanically and mindlessly parroted the cries of those needlessly skeptical about Christ.. Throughout history, unbelievers have relentlessly attacked the gospel. But all the attacks have fallen away like straw. Christ still stands above the ages of men and calls us not to be ashamed of Him or His words. Sometimes a skeptic will ask, "What scientific proof do you have to show that Christianity is true?" When they ask you their question, you need to make them clarify what they're saying. Just ask your own question by saying: "Well what kind of science are you talking about? The Science of Physics? Because Christianity is not something you can burn in a beaker any more than you can burn democracy or the number 7 in a blue flame in a laboratory. Or Maybe You're More Interested in the Biological Approach: But Christianity is not something you can dissect like a frog or a fetal pig in your high school lab class any more than you can dissect the history of Homer or Alexander the Great with scalpel and tweezers. Are You Referring to the Study of History? Of course there is ample historical evidence for the life of Christ, his teachings, his crucifixion, and his resurrection. But I need to know what kind of history you want to talk about. Do you want to talk about textual history or archeology? Or do you want to move on to another field altogether like Textual Criticism? We could dig into some side issues: Like believing the existence of God in general. On this issue, we could discuss cosmology; we could discuss cytology; and we could discuss genetics. So... What I need from you is an honest question that doesn't play games with different categories and approaches to knowledge so that we can we can sit down and have rational discussion." Now, I am not setting myself up as being thoroughly conversant in all the issues I just raised, but there are answers and many lines of discussion in them. It just takes a little study. There's a lot of material out there along these lines. You see, maybe we should put the spotlight on our skeptical friend and ask, "Are you ever skeptical about your skepticism? How can you claim to know anything if the thoughts of your brain are nothing but the results of mindless matter in motion? If you don't have a rational mind that corresponds to a rational universe, how can you make any claims to knowledge at all?" The fact is, people like the producers of this film are not honest in asking their questions. They're trying to move you onto the playing field of their own skeptical perspective without having to answer for the follies of their own philosophy." On one hand, I believe we can use polemics against the products of people attempting to destroy the faith of our young folks. On the other hand, a movie like this can be a benefit because it raises issues exposing where the church and Christian educators often fail in teaching just what Christianity is and why we believe it. There is more that could be said about this video. Logically, it was a train-wreck, but I'm glad I watched it. I'll be more prepared to answer some of the questions it raises. If one really pays attention to each message given at a Ligonier conference, he will take a day or two at home to "come down" from the event. So many things barrage the mind that it takes some time to process one's thoughts. I have a few odds-n-ends I thought I'd post about the conference. 1. At the top of the list is John Piper's message on "The Challenge of Relativism." I thought it interesting that the Hebrews did indeed think deductively--as was illustrated in the text in Matthew 21:23-27. Piper rightly noted that a thorough study of the Scriptures can defend us from the unbelieving sophistry of our day. Secularists and unbelievers like to read their thoughts back into the text of Scripture. But the Scriptures hold their own. Piper's deconstruction of post-modernism's air of "humility" was especially helpful. People who wish to play fast and loose with the truth often do so with the flourish of humility. "Who am I to say what is right and wrong; what is true or false?" These same folks then turn to the Christian and accuse him of arrogance for thinking he knows a measure of truth. Yet post-modernis'ts uncertain epistemology simply serves as a smoke-screen for his desire to autonomously call his own shots--while the Christian seeks to submit to reality. Which is really the more arrogant way? "Creating your own reality like a god? Or submitting to the Reality that is?" This insight is key in showing that the Post-Modern Emperor has no clothes. I think R.C. Sproul, Jr, spoke along these lines as well. Anyway, Piper's message on this topic is extremely important. Everyone should hear it. 2. Ravi Zacharias has been a blessing to me for a long time. I've learned more from him and because of him than I think I can relate. In one of his messages, he told the audience that he is planning to write a book in response to the hard-boiled atheist Sam Harris. Harris wrote a book Letter to a Christian Nation. Ravi said he was going to respond by writing something like A Letter to Sam Harris on Behalf of a Christian Nation. I look forward to reading it. Somehow, I don't think Harris will stand long in the ring with Zacharias. 3. Someone asked in the first Q & A "What movement will follow post-modernism?" One of the answers was "Statism." I think this is true. With everyone doing his own thing, it will take an ever stronger government to keep any semblance of order. I was glad to hear good men say this, because an ever-growing centralized government is what I blog about here. This is a real threat everyone should be concerned about. Statism is on the rise because of the spiritual, moral, and intellectual collapse of the nation. The church is the only hope for spiritual, moral, and intellectual renewal in the years ahead. Pastors has better pay attention. Along with the rise of statism, I think its possible that our secular society will try to move beyond relativism and obtain a moral realism based on unbelief. Sam Harris's book The End of Faith points to the trail-head of this path. A secular moral realism will be a scary thing indeed. It will require an intolerance and strength in government unseen on American shores thus far. Again, listen carefully to Harris in The End of Faith. His view of the world would also lead to An End of American Freedom. 4. The music at the conference was exceptional. I noticed they did not use soloists. I wonder if this is just how things played out, or if there is a certain musical philosophy excluding them. Regardless, the music of the Westminster Brass was God-honoring and powerful I even enjoyed the organ! (I really am not a fan of organs and hope to never see one in our church....) The singing of the "Hallelujah Chorus" following the last message (R.C. Sproul on "The Resurrection") was moving. Good job, music people! 5. I was impressed with R.C. Sproul, Jr. I have never heard him speak before, and I thought his insights were unique and Biblical. I can sense a strong presuppositionalism undergirding his approach to ministry. His point on world-views was very good. We really should not seek a "world-view;" we should seek "wisdom." He did not elaborate on this point, but--it seems to me--he thinks the term "world-view" may play into the post-modernists hand. When we talk about "world-views," we set ourselves up for the response, "Well, that's your world-view. I have a different one." Sproul, Jr. went on to say, "What we really need is wisdom." Again, I think he was telling us that wisdom seeks to understand reality-as-it-is and then conform to it. Metaphysically, there is only one "world-view." We need wisdom to understand it. Everything else is just deception. I would like to hear him elaborate on this further. He pretty much made this comment in passing. He also highlighted the fact that man does not construct his world-view and then fall into sin. Man sins and then constructs a world-view to justify his sin. 7. The conference was well organized, had a terrific spirit, and offered a lot to think about. I thank God for those who love Christ and work hard to stand strong in these incredibly difficult times. All of orthodoxy is going to need to stand together in the coming days. And as we do, maybe God will grant our nation a new birth of spiritual, moral, intellectual, and political freedom. I really enjoyed my conference experience at Ligonier 2007. I'll post again on my impressions about the conference. I have so many positive things to say. However, right now I want to focus on a message John MacArthur brought on "The Problem of Evil." I have a great appreciation for John MacArthur and men like him. I'm grateful to God for the heavy lifting they are doing in these spiritually vacuous days. The writing, speaking, and representing they do in our country is an important witness for Christ and the church. I do need to get some thoughts written down after hearing Dr. MacArthur's theodicy (the justification of God in the face of evil). 1. Evil Exists. This is axiomatic. 2. God Exists. That is, the Biblical God. 3. Therefore, God wills evil to exist; He ordains it. Dr. MacArthur said some things like: "Now this is where Arminians become apoplectic. Their eyes roll back and their palms become sweaty. Panic sets in. So they have to reinvent God with a revisionist [hermeneutic.]" Both speaker and audience gave a knowing laugh at these comments. Now, I do admit to having some emotional responses upon hearing Dr. MacArthur's words. To be sure, I was not apoplectic. I did not experience an increased heart rate or sweaty palms, or panic. But I did feel a sadness, a deflation, and a wonderment at the presentation of his argument. I felt like, "If I believed this picture, I might as well go back to the hotel room and draw the shade." The speaker and audience may laugh with the knowing chuckle of the truly initiated, but I think I can explain why some folks may struggle with this kind of theodicy. When you deal with a man's view of God, you are dealing with the most important part of who he is. So we should not be surprised that emotional reactions may occur when God is painted in certain ways. I have the following concerns with Dr. MacArthur's theodicy. 1. His argument comes very close to an eastern view of God--where good and evil have a common source. Hence good and evil become illusions surrounding the One of all things. Surely, Dr. MacArthur would deny that this is his view. However, to speak his way has the same blurring effect on the soul. It is a de facto equivalent. Did not Christ tell us to pray "Deliver us from evil?" If God ordains evil, then where can a man go to hide from it? If the only refuge from evil is the source of evil, this is indeed a scary thing. Hence the suffocating effect on the soul. "God ordains evil but is not guilty of it." " God is responsible but not guilty." How is this any less a paradox than "Man can choose, and God is sovereign?" 4. In the Q & A about this issue, I believe it was Dr. Sproul who distanced himself from "determinism." And I noticed one of the nearby Table Talk magazine covers had a puppet with strings attached. The subtitle was, "What Reformed Theology is Not." But one cannot use the language of determinism and then cry foul at being perceived as deterministic! Man was created as a Real Person. I believe that God is Good. There is no shadow of turning in Him. If He cannot tempt men with evil, He surely doesn't direct them to commit it! I have to hold to a theology (paradoxical as it may be) that separates evil from a sovereign God--as the Bible does. I believe that God created the world knowing full well that man would sin, but His love created a solution before the foundation of the world. But man's sin was against God's will. I believe that when men are damned, it is because men are truly guilty. It's our fault. We have rebelled against our Maker. I believe that God is sovereign when He chooses to act or not act--according to His own will. How is God's sovereignty reduced if He chooses to limit Himself in any way? If God chooses to make real persons in His image, isn't that His business? Why could not God ordain that people have a will? Dr. MacArthur sounds like God values evil more than creating amazing creatures in His image. I have some follow-up issues with the theological perspective Dr. MacArthur represents. 1. I think Michael Horton, in the afore-mentioned "Table Talk" magazine, said their view of election brings great consolation to God's people. I've never found their view of election to bring consolation. I have known their view to bring the opposite. Their view of election puts my eternal destiny--not in the hope of the gospel, but in an impersonal and arbitrary Will. Their view of election is an amplification of God's sovereignty apart from the context of His personal nature, virtue, love, mercy, grace, and faithfulness. Their view of election erects a high, thick, circular brick wall on which I find myself pounding from the outside. 2. How does one know if he's elect? It seems that according to their view, you know if you're elect if you persevere in righteousness. I have found this to be a back door to legalism. Instead of trusting the promise of God in the gospel, I would find myself trying like mad to convince myself that I'm elect by looking at the subjective experiences in my life: my performance. No grounds for confidence there! 3. Sometimes, I sense a condescension in some folks I've met in Dr. MacArthur's theological camp. It is the air of being in the "know." I'm sure this is unintended on their part, yet I do perceive it. Maybe it comes from being in the inner circle of election. However, I have very true and extremely valuable friends who are not this way. With the love of Christ, they listen to my concerns about their view. So I honestly try to see the "glory" of deterministic theology. I can tell it is a source of consolation and security for many. 4. I have heard some say that people don't like Dr. MacArthur's theology because it strikes at the pride in man. Well, I acknowledge pride needs to be stricken. However, I think I react against it because it strikes at my hope in God. If salvation is based on the Great Will instead of the Glorious Gospel of God, I know I have no hope. 6. I'm willing to be put in the same camp as "liberals," but I'm not sure how I could honestly be so labeled. I affirm that God's eternal justice redounds to His glory. It is good that evil is finally destroyed from His presence. But the picture is bigger than this one aspect. And God takes no pleasure in the death of the wicked. I affirm that men's salvation redounds to God's glory in eternity, but it is in a context of God's love for real and responsible people. I affirm that God is sovereign, in charge, and victorious. But He is not Fate. Creation is not a gray, two-dimensional, deterministic sketch. It is a wonderful three-dimensional world filled with people made in His image. Sin has effaced this image, but it is still there. I affirm that justification is by faith alone--not by anything meritorious in a sinner. I affirm that God is omnipotent. I affirm that God is omniscient. I affirm that God is sovereign. I affirm that God wants to save me--nor is willing that any should perish; that He loved the world; that He is the propitiation for our sins, but not for ours only but for the sins of the whole world. I deny works-for-justification, the loss of salvation, universalism, "open theology," and "process theology." I hope I am not "revising" God. I hope I can honestly say, "I'm simply trying to account for the big, Biblical picture." Yet, in all this, I truly believe I have more in common with Dr. MacArthur than I have in distinction--namely, the Savior. 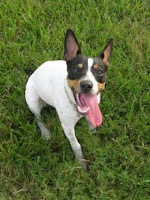 I recognize this little post on an insignificant blog must resemble a rat terrier yapping at the heals of a great theological mastiff. But, there you go. And I'm brought full circle to thanking God for His good use of Dr. MacArthur in this needy world. I quickly shook off the air of sadness brought on by one sermon, escaped its great flattening of the world, and got back on track by rejoicing in the goodness of God--and the future destruction of evil. R.C. Sproul addresses "The Resurrection of Christ"
Hymn: Were You There When They Crucified My Lord? A couple of days ago, I read about the recently discovered bones of Jesus. The more bizarre the proposition, the more media it gets... The author acknowledged that the scholars scorn the "Lost Tomb" propostion. Poll: 78% of Americans believe in the Resurrection of Jesus. But the author inserted the phrase: "78% believe in the myth of the Resurrection." Job asked, "If a man dies, shall he live again?" In the 70's (the 1770's) one major event took place, but it wasn't the Declaration of Independence. But something happened in Europe that had greater implications. One man, a professor in Prussia--in the field of astrophysics--who never traveled more than 100 miles from his birth place and took punctual afternoon strolls--had a name Immanuel. Immanuel Kant wrote the most definitive and comprehensive critique (The Critique of Pure Reason) of the arguments for God. As a scientist, he argued that we cannot move from the visible world to invisible world. We cannot go from the phenomenal world to the noumenal world. He critiqued the classical arguments for God to save science from David Hume's skepticism. This created an seemingly unbreachable rift between science and theology. He ushered God out the front door and tried to let God in the back door: not in metaphysical pursuit, but in practical thinking. He was concerned about ethics and morality. It seemed that in man, there was a universal sense of duty--oughtness. The categorical imperative. Pragmatically, Kant asked what would the necessary conditions be to make this sense of oughtness to be meaningful? How can ethics be meaningful? The survival of civilization cannot survive long without an answer. He said that there would have to be justice. Without justice, fulfilling our duty becomes a fool's errand. But justice does not always prevail in the phenomenal world. Why do the wicked prosper and the righteous suffer? For justice to be true, we must survive the grave. And beyond the grave, there must be a Judge who would mete out and dispense pure justice. What are the necessary conditions for this Judge to mete out justice? He would have to be perfectly righteous and beyond reproach. The Judge would also have to be omniscient to be free from misinformation. A just Judge cannot be susceptible to a miscarriage of justice. But a Perfect Judge alone cannot secure justice. So the Judge would have to have all power and authority to mete out this justice. Metaphysically we cannot postulate this Judge, but for practical concerns, we must assume His existence. So we must live as if there were a God. This thought process held back a full torrent of skepticism. But the cracks in the dam soon gave way. A metaphysical and ethical Katrina took place. Verse 12: How can you have a Christianity without Resurrection from the dead? Paul uses a common form of debate in the following passage: The Ad Hominem of Argumentation. Be careful.... Paul is not falling into the informal fallacy of the Ad Hominem Abusive. This fallacy is creating the criminalization of politics today. But Paul is not falling into this fallacy. But there is a sound form of Ad Hominem reasoning: Arguing to the Man. I step into the shoes of my opponent. We stipulate agreement on certain premises, and then we see where the "granted premise" goes in its logical conclusion. This leads to the reductio ad absurdum. So Paul wants to show that Resurrection deny-ers will lead to absurd conclusions. His opponent had an absolute position--a universal negative: Dead Men Do Not Rise. THEN CHRIST IS NOT RAISED... (a necessary inference). Let's face facts. Don't live in an Alice-in-Wonderland Theological Dreamworld. ALSO: We're mistrepresenting God! We'd have to name ourselves "Jehovah's False Wintesses." ALSO: We are still in our sins. We are contained, enmeshed, in jail to sin without bail. Because our justification does not end with the cross. Jesus was raised for our justification. The resurrection is God's apologia. Christianity stands for falls with the Resurrection. ALSO: Our beloved who have died in the faith have perished. This is the grim reality... if there is no resurrection. If in this life only we have hoped in Christ, we are of all people the most to be pitied. I say to the enemies of the Christian faith, "If you don't like what we preach, don't hate us. Pity us. We forfeit whatever the world has to offer before going into a hopeless oblivion." This is why the Bible says that without Christ we are without hope. What has Paul just done? He has drawn a gastly picture of the consequences of no life after death. Life itself, under the sun, is meaningless. As Kant understood, your ethic is meaningless. And society cannot last--we are doomed to barbarianism. Our nation is going to barbarianism with such velocity, we wonder if it can stop--apart from God's intervention. The only thing left in life is to MAKE WHAT IS RIGHT BY YOUR MIGHT! What Kant was saying was this: Since the alternative to Life-After-Death is so grim and meaningless, We must live as if there is a God! Here is using God as a crutch! But Nietszche comes along and blows Kant away. I'm not going to live with the assumption God just to make life bearable! Let's face the abyss! Let's face the nihil! The nothing. This was affirmed by Jean Paul Sartre: Existence is Naseum. Albert Camus said the only serious question left for philosophers to examine is the question of suicide. So Kant's arguments didn't survive the next generation. Gird up your loins like a man, Kant! Face the inevitable. Some would say that Paul is doing the same thing. But Paul does not argue for the Resurrection because the Life's Hopelessness Without IT!!! No, this is not the foundation of his argument. Paul uses nature as examples of resurrection: Seeds. And in like manner, when our bones go into the ground in mortality, they are raised in immortality. This argument closely resembles Plato's argument. But Paul doesn't rest his case on analogies of the seed or of the butterfly. Why Does Paul Assert the Reality of the Resurrection? Because Paul believes the Gospel he mentioned in the first part of the chapter: 1 Corinthians 15:3-4. We found an empty tomb? What can it mean? The disciples did not proclaim the Resurrection based on the empty tomb! No it was the appearance of Christ! The resurrection had over 500 witnesses--and the others. But what I'm writing to you, my dear friends in Corinth, is not on the basis of hearsay (as good as the hearsay is....), but as one born out of due time. The text is written is by an eye-witness of the Resurrection. One reason the above news reporter says that the Resurrection is a "myth" is not that Paul was stupid, but because--judging from our 21st century understanding of biology--we know that when people die, they stay dead. Since it is impossible for the dead to rise, the New Testament story must be wrong. What a different view of life is in the New Testament! In the New Testament, it was impossible for death to hold Christ! Our empiricism does show that dead people stay dead. But our empiricism is that the dead people were sinful people. So death must be inseparably tied to sin. It is the soul that sins who dies. So if Christ had no sin, how can we expect Him to stay dead? It is remarkable that Christ died in the first place! But having paid the price and finished the work, the Father raised Christ from the tomb! The Resurrection is God's Proof of the Person of Jesus! Paul debated the Stoics and the Epicureans at Mar's Hill. He noted the "Unknown God." "What you worship in ignorance, I proclaim to you in power...." If you stumble at the Resurrection, how do you account for life itself! The necessary conditions for life are not found in us--or in the physical universe! The only one who has the power of life, being, and motion is the eternal, self-existent God! He has the power of life and death. He holds the keys. If Christ can raise Lazarus, His Father can raise Christ. What is so hard about that to believe? If there is life in the universe anyway, why is this so difficult. It is impossible that Christ should not have risen from the dead. BTW, it was abhorrent to the 1st century man that someone should rise as it is to us today. It was just as difficult to believe back then as it is now. It's not like they saw resurrections all the time! The times of ignorance, God overlooked. Now He commands all people everywhere to repent because He has fixed a day in which he will judge the world in righteousness by the man He has appointed and given assurance to all in raising Him from the dead. The Resurrection is the final apologetic. Is time for us to believe. God commands us to believe! He doesn't invite. He commands. The proof is given: BY RAISING HIM FROM THE DEAD! Well, you may say, I wasn't there, so I can't holler glory. Send Christ back and show death and resurrection again. No, Christ did it once for all. God is going to judge us by this one act. We don't believe in the Resurrection because the grimness of the alternative, but because of the testimony of its reality in Scripture. Be unmovable, abounding in the Lord, because our work is not in vain! GOD RAISED CHRIST FROM THE DEAD. How is it possible to say that God is responsible for evil but not guilty for it? RC: References Joseph's quote. "You meant it for evil, God meant it for good." When evil comes, it is truly evil. But when God decrees it, it is good that it occurs. This means it is good that evil exists, or it wouldn't be here. Evil is evil, but it is good that it is here, or God wouldn't ordain it. That isn't difficult! (Laughter). Mohler: Rather than seeing God as essentially good. We abstract goodness and then measure God against it. But we don't know what good is. God defines what is good. Our human abstraction does not. We must have an eschatological view of this as well. J.M. Boice, "God's judgment in the end will be so absolutely perfect that the damned will agree with their damnation." We are dependent upon the eyes of faith on this. We cannot defend God against a human abstraction of good. His will is consistent with his character. Ravi: The whole anti-theistic moving ties themselves into knots on this issue. We kick God out of Christmas and then the tsunami hits, and we wonder where God was. You cannot deny absolutes without smuggling it in the back door. Is Evolution Compatible with Scripture? RC: Distinguish between micro and macro evolution. Nobody denies micro. But macro evolution is a philosophical view. It is not compatible with the Bible, and it is not compatible with science. RC asked students why they believed in evolution. They said "Science." But what is it that persuaded you? "Well... all living things are made of the same base materials. Common substance=Common Source." No other arguments were given. Finally, it came out: "That's what I was taught in my high school biology class." The question of the origin of life is not by analysis a biological question. It is a historical question. Mohler: The dominant model is naturalism/materialism. Let's remember that Darwin did not invent evolution. Darwin's grandfather was a notorious evolutionist. But evolution is really absolute naturalism. Evolution is not compatible with Christianity. Ravi: You're right. Your right. The irony of this is to risk being a an outcast in academia. Liberalism is the most bigoted philosophy around today. Some Congressman took issue with Ravi on this. "If you truly are a liberal, tell me why when the conservatives were in control, students were taught the counter-perspective." This is not so today. Ravi's friend did a dissertation on the Trinity, but the tribunal rejected it for publication because it was not gender-sensitive--referring to God in the masculine. When Oscar Wilde was dying, he asked for a minister. This stuff is not published. Mohler: ID is not the Christian doctrine of creation. The establishment should not be upset about ID, but as "fundamentalists," they cannot handle it. RC: Cain married his sister. But the geneologies did not list women because they were not gender-sensitive. The prohibitions against consanguinity were not immediately given. They came in later. The reason why the Bible talks about the "hovering" over the waters was that Moses went to sleep and forgot..... (Laughter). The "deep" refers to abyss--the empty darkness. The Spirit hovered over it. The water was not the oceans and rivers and streams. Ravi: The water was there but not separated. God separated water already there. Whoever you are as an eight-year-old, write to us. We want you on our team quickly. Mohler: The four of us are going to disagree on things, although we believe in the law of non-contradition. When I face judgment, I will no longer see through a glass darkly. We're embryonic compared to what we'll know and see in heaven. Moderator: BIble-believing Christians are the last group who can have an honest disagreement. Mohler: One thing we as friends up here is to check with in another. Some things I had to be corrected about such as complemetarianism of men and women against egalitarianism. When Did Post-Modernism Start and By Whom? Mohler: Before long, people are going to call Plato the first post-modernist! This is difficult to clarify. In our culture, it rose after WW2. RC: It comes from the serpent in the garden. Ravi: I think the word was first used by Toynbee (spelling?) in 1941. What Are Diagnostic Symptoms of PM? Mohler: The truth issue. This is the central issue. Truth is absolute and unchanging and language is capable of expressing it. Post-modernists deny this. RC: And that's the collision course with the New Testament. The NT teaches there is a "real state of affairs." What Are Your Thoughts on the Emerging Church? Mohler: It can mean many different things: from merely a "mood" to the embrace of post-modernism. They react to the "overly cognitive." I would give strong warning, but the emergent brand is the hard-line form represented by Brian McLaren. He's right up front with rejecting law of non-contradiction and embracing relativism. The website named "The Ooze" is emergent. We need to be very careful about this because today's liberals were evangelicals yesterday. If you get the truth question wrong, you'll be abberant in the life of your church and personal walk with God. This is a new form of liberalism. RC: This makes you wonder about the question, "Can you be wrong?" In Post-modernism, there is no category for right and wrong. And Post-mondernists are uncomfortable with a creedal posture. They have a built-in allergy to this. Ravi: Vance Havner, "When the tide is low, every shrimp has its own puddle." This is one of those puddles. These men and women---are they bored with God? What brought this methodology into a theology? When you write a book called, "The Secret Message of Jesus?" You've discovered it after 2000 years? The problem is that non-critical people are absorbing this stuff. Just what does McLaren believe? He's always postulating doctrine against doctrine. RC: This appeals to people who don't like doctrinal complexity and difficulties. If we disagree doctrinally, that 's a bad thing. But truth is too important to kill it in the streets for the sake of peace. Mohler: In Time Magazine, McLaren was asked about his stance on homosexuality. He said something like, "I don't want to answer that because it will offend something..." This is an abdication of Christian responsibility and courage. What About Seeker Sensitive Movement? RC: It is a very, very bad thing. A fundamental error: Unbelievers outside the church are desperately seeking for God. And the error of thinking that the purpose of corporate worship on Sunday morning is for evangelism. (More...) Fundamentally, Sunday morning is for believers to gather to worship, learn, take the Lord's Supper. Our primary concern should be "What pleases God?" Not "What pleases the unbeliever." Mohler: The language of this issue is dated. But the logic is not. Here's the logic: If you scratch where people itch, they'll be more open to the gospel. You'll earn their trust because you've met their needs and will be trusted for the Gospel. But this doesn't work. And we never get to preaching the gospel. Dr. Zacharias, Could You Share Your Experiences at the Mormon Temple? Ravi: It was a tough invitation. When I heard from the Mormon offices, I wondered what this was about. I wanted a face to face conversation about this. I said, "Why are you asking me to do this?" "We respect you?..." I wondered, "Am I going to be used here?" I considered it under 1 condition: I select the subject: The exclusivity and sufficiency of Jesus Christ. And then 2nd condition, "I bring my own music---like Michael Card." Then all of a sudden, the attacks started coming. Now I said, "I'm going to get shot at from the back!" I can only fight on one front at a time--was going to decline the invitation. But then I got letters from Dobson and Colson: "Don't turn this invitation down!" Ravi's wife did not send the letter of declination! Some marvelous responses! Go rzim.org and order the CD. Michael Card sang "I'm Not Supposed to Be Here." Bloggers got busy... I just didn't read them. I'll go speak to any group that challenges orthodox Christianty. Was the Catholic Church Ever the True Church? Where Does One Start with Evangelizing a Muslim? Ravi: Tough question.... My answer may be a bit controversial. Basically, the Muslim denies everything the Christian cherishes at the root. Let me tell you how God is scaling the wall here... (Story: Call Me Joshua, in Iraqi army. I was taught to kill without feeling and make false passports. I dreamed that Jesus was calling me to himself. His mother said, "Don't tell your brothers. They'll kill you." For 7 years, he had the same dream night after night. He's in seminary and planning to go back to Iraq. God is working in those lands. What is reaching them is the love of God. The more you focus on the single distinctive between Allah and God, the more effective you can be: The Love of God! The muslims view the cross as a losing symbol--how can God be beaten up? (Illustration: Little Boy Bullying Joe Lewis.) But we must show that the cross is the love of God. Avoid criticizing Mohammed. That will come later. Focus on Christ. How Can Martyrdom Authenticate the Word of God? Mohler: It's not martyrdom in itself. Christianity centers on the fact that they were willing to be killed for Christ. They believed he was risen. The point was that lives were so transformed, it shows the power of the message. The Resurrection was seen and testified to by witnesses! It encourages people not to fear death. Many differences between Christian and Muslim martyrdom. Christian's must be willing to die for the faith, not kill for it. Martyrdom is not the first proof. It is listed as the last. Al Mohler addresses "The Holy Spirit and Apogetics"
Where else would you want to be on bright Saturday morning? Why are those who believe and those who do not? A constant question. 1. The world thinks we're nuts for being here this morning. They have no understanding for thousands to meet together on a day like this. 2. The church has always had a problem with the "crowd." There are many Christian crowds who think they are Christian churches. We have problems distinguishing between the crowd and the church. 3. The disciples had a problem with the question of why others don't believe. And they asked, "Why do you preach in parables?" But it really isn't a question. The disciples are confused about what Jesus is doing with parables. Here is one of the largest crowds gathered together, and Jesus uses parables to speak to them! The disciples are ready to launch the crusade! This is amazing! And then, when they think that Jesus is about to announce the inauguration of the kingdom, He stands up and tells a story: hard ground, stony ground, shallow ground, and good ground. He who has ears to hear, let him hear. "You can go home now." This perplexes the disciples! Why (in the world!) did you speak in parables? Jesus says that it is not granted to them to understand. "You know the Bible. You should see in this the fulfillment of Isaiah's prophecy in chapter 6. We love the part where we see the holy God, the conversion of Isaiah, and the calling. But we struggle with the truth that Israel will keep hearing and perceiving, but they will not understand or see. They will not turn to be healed! Why are there some who respond to the gospel in faith and are transformed, while others hear the very same words (with the same intellectual capacities) but do not hear or understand. But if we understand what it takes for people to come to Christ in faith, we will not be surprised. This is not a new problem. It is as old as the Christian church. Augustine addressed the issue: Why is it that two people hear: one despises and the other rises up. Only God knows. It is not to the credit of the one who believes, but it is to the judgment of the one who disbelieves. It deals with the noetic effects of the Fall--the effects on the mind. 3. Our inability to know the things of God. This is a deeply spiritual epistemological process. Why do so many refuse to put the spiritual spectacles on? Why do they prefer the scattered bits of knowledge and idols? Because our crisis is deeper than we knew. We are entirely dependent upon the Holy Spirit. We should expect this reliance upon the Holy Spirit. He will teach and bring to remembrance all of what Christ said. The Holy Spirit will teach us all things! "Word" and "Spirit" are always conjoined. THe problem is not with the revealed Word. The problem is with the heart of man. In this promise in John 14, we anticipate the writing of the Holy Scriptures. John 16:5-15 The Holy Spirit is noted by the important title "Helper." He will convict the world of sin and righteousness and judgment. How else will the convicting take place? It is clear that this passage addresses the life of the church. In verse 13, the Spirit is known as the spirit of truth! He will no speak of his own initiative. We cannot sever the Holy Spirit from Scripture! It is interesting how little material concerning the Holy Spirit is in the New Testament, but when we see that He comes to glorify Christ, we can understand this. For the human life to be transformed, the Holy Spirit must do His work. Trinitarianism is essential to Christianity. All the historic branches of Chrsitianity understand this, but so many evangelicals today do not. 1 Corinthians 2:1ff: Paul did not use rhetoric to preach the gospel. He came in weakness and in fear and trembling! He did not use persuasive words of men. He came to preach with a demonstration of the Spirit and power. The Spirit came so we might know the things given to us by God, but the natural man does not receive these things. This is a humbling teaching of the New Testament. The only reason we see and hear what others do not is the sovereign grace of God. This grace was expressed in the work of the Holy Spirit: the internal testimony of the Holy Spriit. This is not a form of enthusiasm where the Spriit comes to speak apart from Scripture, but to point our minds to the Scripture. Saving faith (fiducia) comes from the Spirit. As lost men, we can know a great deal! We can make, organize, perceive, and observe many things! The unregenerate can grasp truths in Scripture and understand the facts of the gospel. But this is not fiducia. The Holy Spirit does not open our hearts and eyes so we can embrace the irrational. No, he works so we can embrace what is plainly there! This is an important point. The spirit does not move us to believe against the evidence but to surrender to the evidence that is there. We are not here because we escaped the effects of the Fall on our own! No, we see because the Holy Spirit caused us to see. Why Are There People Who Know So Much Yet Know So Little!!!! Many believe in a creator! For example, the Intelligent Design movement. People can see that there is a creation, but this is not enough. Only the Spirit can show us God in Christ, God's church, and the Gospel itself. Our reliance upon the Holy Spirit in life and apologetics is absolute. It is by grace that we believe. It is an insult to grace to believe that people could come to Christ apart from the Spirit. His work is more comprehensive than we will ever understand. In all His work, He points to Christ. We must read and hearken to Scripture to receive anything from the Spirit. - Calvin. You want to be rescued from the chaos in contemporary evangelicalism? Understand that the Spirit and the Word are in union! The Word is the instrument that the Spirit is dispensed to believers. The word becomes efficacious for our faith through the Holy Spirit. The mind is dull. WIthout the illumination of the Spirit, the Word can do nothing. 1. The Reality of the Outward and the INward Calling. The outward, public declaration of the gospel. When we converse with the lost, we are giving the outward call. Martin Luther (a seminary "president'). Many of Luther's students were enthusiastic and tearing out private mass alters from homes. Luther told them, you can tear down all the alters you want, but people will fall back and build them back. You must simply preach the word! Don't waste time tearing down alters! We have to let the Word do this thing! It is the only thing that can effect change. Our job is to get the word from our mouth to people's ears. But only the Spirit can take the Word from their ears to their hearts! Today, we have no clear outward call to the gospel. This is absolutely required, but it is not enough. Only the Spirit can reach where we cannot reach. 2. Our Absolute Dependence on the Spirit for Evangelism and Apologetics. We are not left without the Helper! Jesus said it was better for Him to go so the Spirit can come! Only He can break through the noetic effects of the Fall. 3. We must be clear about the nature of faith that saves. It includes a framework of true propositions. We must have more than assent. We must have faith (fiducia). It is a firm and certain knowledge that God has been good toward us in the freely given Christ, revealed to our minds and sealed to our hearts where these truths are confirmed within us through the Holy Spirit (Calvin). 5. The Necessity and Utility of Expository Preaching. The Bible says, "Preach the Word!" The Holy Spirit uses this preaching to convict sinners and call them to Christ. Our job is to get God's word from our mouth to their ears. Only God can get the Word from their ears to their hearts. The disciples assumed that the Matthew 13 crowd assembled because they wanted Christ. But there were a variety of motives for their coming--only some wanted to know Christ. 6. The Law of the Ear: Those who hear get more. Those who do not hear lose what they have. The one who rejects the word ends up with nothing! This is why Christ spoke in parables. Those who hear to not perceive. The disciples did not believe because they were smarter than the rest! They were not "so spiritually sensitive." No the disciples of Jesus were not smarter or more sensitive. They were not the seekers. They were the sought. We know so much more about the physiology of hearing (Mohler impressively and quickly describes the physical process of hearing---audience claps. "And I have no idea what I've just said!). We can know the auditory process and know nothing about the Gospel. There are those who have never heard (the deaf), but they hear the gospel clearly. There are those born blind but can see Christ. Blessed are your eyes that see and your ears that hear! Al Mohler addresses "The Authority of Scripture"
Ok. So now I'm beginning to experience a brain melt-down. The all-night drive from East Tennessee, sleeping in an odorous hotel room (not the best accommodations in Orlando I'm sure...), and drinking from the theological fire hose (and enjoying it...) are beginning to catch up with me. I was taking pretty good notes on Mohler's message, but I realized toward the end that my hand-writing was beginning to look like scribbles falling off the edge of the page. So-- here is a stream-lined notation. Ice-Breaker: Sometimes the media just ask stupid questions. You can dance around some stupid questions and dress up others--but then the quintessentially stupid question is hard to respond to. When, at the age of 33, Mohler became president of Southern Seminary, a reporter asked, "Dr. Mohler, you are 33 years old. What are you going to do about it?" Mohler's only response was "I intend to age." Epistemology is the study of how we know everything. It seeks to explain the process, possibilities, and products of knowledge. And some issues are epistemologically complex. The more important the question, the higher are the epistemological stakes. The issues of germs, global warming, and God's existence are all epistemological issues. 1. When did everything begin? 2. What has gone wrong? Marxism, humanism, naturalistic scientism, and eastern philosophies address these 4 questions one way or another. We as Christians are inheritors of a world-view that answers the questions with beauty, symmetry, coherency, and correspondence to reality. The image of God in us is expressed epistemologically. Animals do not ponder the 4 questions. When we go to the zoo, we read a humanly written guide to the animals--not a guide written by animals about humans! Romans 1 reveals that the knowledge of God exists in our hearts, but we have corrupted that knowledge. Indeed, mankind has a quest for God, an impulse to worship, but it is corrupted and leads to idolatry. Our idols today are very sophisticated (many of them are digital), but they still have the stench of death around them. No. As Francis Schaeffer has written, He is There and He is Not Silent. God has not left us alone in our epistemological crisis. And His revelation is not merely found in our intuition, ideas, concepts, or vague awareness. God has revealed Himself in WORDS. Contrary to postmodernism, the "text" is not dead. We don't live that way in the real world. What is written actually reveals at the same time as it limits. The God of the Bible is a speaking god. He intervenes and speaks. And, as Carl Henry mentioned, He "forfeited his own personal right to privacy so His creatures might know Him." God's self-disclosure is a manifestation of God's grace. God's self-disclosure is the inscripturated word. The Bible is our access to the revelation of God in Christ. It is even better than the eye-witness testimony the apostles enjoyed themselves! Christianity is the only world-view with a complete account of revelation. The Bible calls us to a Christological interpretation of the Old Testament. It is also profitable for teaching, reproof, correction, and training. When we discuss the Bible, we mean the 66 books of the canon. And we are positive about this canon and negative about every other claimant to revelation (i.e. Koran or the Book of Mormon). The 66 books did not come from one man, but many. It came over many centuries--verified by the generation that received it! It is written in differing circumstances, styles, and genres, yet it all coheres and corresponds to reality. It makes historical claims at the time that the recipients would have known about. Again, it was verifiable by those who received it. It is preserved by God through successive generations. It is a book of antiquity. The more textual history is known, the more the Bible is confirmed. Archaeological discoveries continue to confirm Scripture. Example: While excavating for a new airport, remnants of Molech worship were discovered: remains of human sacrifice of children under the age of two. In the past, skeptics said there never was Molech worhip. Such talk was merely Jewish propaganda against the Canaanites. Predictive Prophecy also shows the supernatural truthfulness of Scripture. SO: When Scripture Speaks, God Speaks. This philosophy/truth is immediately a limiting factor! We must limit ourselves to the Scriptures of God--or we will be "seeking uncertain deities by devious paths (Calvin)." God's Word reveals and limits at the same time. 6. Martyrdom: People have given their lives in loyalty to the truthfulness of Scripture and the truth of Scripture. Other signs of the Bible Authority are consistency, coherence, candor (it shows the heros of the Bible with their flaws...), the Focus on Christ, and the display of Promise and Fulfillment. See You Tomorrow. - JR.
Ravi Zacharias addressed "The Existence of God." R.C. Sproul introduced Ravi Zacharias as someone who does not sit in an ivory tower simply talking about apologetics. He practices apologetics in the most hostile of atmospheres. Sproul mentioned that Zacharias has a "rapier intellect," and he uses it with "a singular grace." "His person is as much an apologetic as his message..."
If God is dead, then we have to redefine everything. We have intense problems with defining morality. How can we make any moral pronouncements if there is no God? But the problem of evil is something that people use to deny God's existence. However, the existence of evil must presuppose the existence of good. And "good" must be defined by an objective standard--a moral law. And if there is a moral law, there must be a moral law-giver. "Pure practical reason....will not lead you to morality..."
We have intense problems with positing any meaning. We have intense problems with having any hope. Ravi mentioned that one Iraqi pastor he recently talked to was almost blown-up in a terrorist's bomb. Ravi asked him if what America did in invading Iraq was right. The pastor responded that before America came, we live with constant pain. Now we live with pain--but we have some hope. People need some hope! Atheism has no hope to offer. Stage 2 The Argument TO Design. Evolution is not an explanation for ultimate origins. What caused the Big Bang? The Big Bang didn't evolve! But we must consider the philosophical issues! When Francis Collins looked at the human genome--our DNA, he said, "I felt like I was looking at the book of life." Stage 3 The Course of Human Events (Historical, Social, and Personal) demonstrates the existence of God. Why Does the Gardener (Christ) Reveal God? 1. He Describes the Human Condition Accurately. Just as He knew the Woman at the Well, He knows every human heart. No other religious figure can do this like Christ. 2. The Coalescing of Absolutes Is Found in Christ. Evil, Justice, Love, and Forgiveness are absolutes and they are fully displayed in the crucifixion of Christ! The Cross was the true Cosmic Drama. The Trinity: The Trinity is the only possible answer to the old problem of the "One and the Many." The world is an expression of unity and diversity. And the effect must reside in the cause. If unity and diversity are in the effect of creation, they must exist in the cause of creation--God. The Resurrection of the Body In God the physical and the spiritual are brought together in a sacredness. We must respect the human body as well as the human mind/soul. Ravi then finishes with a quote from Reagan: "Serve the atheist a fine dinner and ask him if he believes in a cook"
A late start (this is a euphemism...) and the absence of parking (this is an excuse...) made me miss the first half of the first session this morning by John MacArthur. This session dealt with The Challenge of Science. I will have to send anyone who may still read this blog to Tim Challies' post about this session. Tim Challies is also here blogging about the conference. John Piper on "Faith and Reason"
Thursday, March 15, 8:45 p.m.
John Piper brought this message just less than a week after the passing of his father. I was glad to be able to hear him preach tonight, although I did not really expect him to be at the conference. One thing I've learned quickly about John Piper (this is the first time I've heard him preach in person...) is that he knows exactly what he wants to accomplish each time he enters the pulpit. This helps the audience learn because everything is so clear. Tonight, Piper wanted to discuss Reason, Faith, and the Relationship Between the Two. Let’s begin our reflection on reason by looking at Matthew 16:1-4. When I was in seminary, there was much talk about Hellenistic thinking versus Hebraic thinking. An example of Hellenistic (or Greek) thinking would be Aristotelian logic, which has the syllogism at its foundation: “All men are mortal; Plato is a man; therefore, Plato is mortal.”1 The point of this distinction between Hebraic and Hellenistic was that the Bible tends to be Hebraic, but we tend to be the heirs of Hellenistic thinking. So if one uses Aristotelian logic in understanding the Scriptures, one is presumably historically uninformed. The Bible does not have its roots in linear, Aristotelian (sometimes called “western”) logic, they said, but in relational, experiential knowledge. What is Jesus saying to these Pharisees and Sadducees? He says in verse 2, “When it is evening, you say, ‘It will be fair weather, for the sky is red.’” What does that mean? It means that these Hebraic Pharisees and Sadducees are thinking in Aristotelian syllogisms. Premise #1: Red skies in the evening portend fair weather. Premise #2: This evening the skies are red. Conclusion from these two premises: The weather will be fair. And again in verse 3a: “And in the morning, ‘It will be stormy today, for the sky is red and threatening.” Again they are thinking in an Aristotelian syllogism. Premise #1: Red skies in the morning portend stormy weather. Premise #2: This morning the skies are red. Conclusion from these two premises: The weather will be stormy. Why then can’t they use those same faculties to interpret the signs of the times? The answer is given in verse 4: “An evil and adulterous generation seeks for a sign, but no sign will be given to it except the sign of Jonah.” What does this mean? What does being adulterous have to do with their inability to use their eyes and their minds to interpret the signs—that is, to recognize Jesus for who he is? Jesus described himself elsewhere as the bridegroom (Matthew 9:15; 25:1ff.) who has come into the world to obtain his bride—his chosen people. But the people who thought they were the people of God were by and large unwilling to have him as their husband. He was not what they expected, and they did not want to be his people or his bride (see Luke 14:18-20). They were, in that sense, adulterous. Their hearts went after other spouses—other gods, other treasures (see Luke 16:14; Matthew 6:5). Nevertheless, the New Testament speaks of the use of our minds everywhere in the process of Christian conversion and growth and obedience. For example, at lease ten times in the book of Acts, Luke says that Paul’s strategy was to “reason” with people in his effort to convert them and build them up (Acts 17:2, 4, 17; 18:4, 19; 19:8, 9; 20:7, 9; 24:25). And Paul said to the Corinthians that he would rather speak five words with his mind to instruct others than ten thousand words in a tongue (1 Corinthians 14:19). He said to the Ephesians, “When you read this, you can understand my insight into the mystery of Christ” (Ephesians 3:4). In other words, engaging the mind in the highly intellectual task of reading and construing Paul’s language is a pathway into the mystery God has given him to reveal. The only kind of faith that matters in the end is saving faith—the faith that unites us to Christ so that his righteousness is counted as ours in justification, and his power flows into us for sanctification. In other words, I am not interested in faith in general—the faith of other religions that is not faith in Christ, or the faith of science in the validity of its first principles, or the faith of children in their parents, or any other kind of faith that is not in Christ. I am only interested in the faith that obtains eternal life. The faith that saves. The faith that justifies (Romans 3:28; Galatians 2:16) and sanctifies (Acts 26:18; 1 Peter 4:11). But we must make clear what this actually means, because there are so many people who say they have received Christ and believed on Christ, who give little or no evidence that they are spiritually alive. They are unresponsive to the spiritual beauty of Jesus. They are unmoved by the glory of Christ. They don’t have the spirit of the apostle Paul when he said, “I count everything as loss because of the surpassing worth of knowing Christ Jesus my Lord. For his sake I have suffered the loss of all things and count them as rubbish, in order that I may gain Christ” (Philippians 3:8). This is not their spirit, yet they say they have received Christ. One way to describe this problem is to say that when these people “receive Christ,” they do not receive him as supremely valuable. They receive him simply as sin-forgiver (because they love being guilt-free), and as rescuer-from-hell (because they love being pain-free), and as healer (because they love being disease-free), and as protector (because they love being safe), and as prosperity-giver (because they love being wealthy), and as Creator (because they want a personal universe), and as Lord of history (because they want order and purpose); but they don’t receive him as supremely and personally valuable for who he is. They don’t receive him as he really is—more glorious, more beautiful, more wonderful, more satisfying, than everything else in the universe. They don’t prize him or treasure him or cherish him or delight in him. Or to say it another way, they “receive Christ” in a way that requires no change in human nature. You don’t have to be born again to love being guilt-free and pain-free and disease-free and safe and wealthy. All natural men without any spiritual life love these things. But to embrace Jesus as your supreme treasure requires a new nature. No one does this naturally. You must be born again (John 3:3). You must be a new creation in Christ (2 Corinthians 5:17; Galatians 6:15). You must be made spiritually alive (Ephesians 2:1-4). Which brings us now to the relationship between faith and reason as we have described them here. What we have seen concerning the nature of saving faith determines what will be a sufficient and reasonable ground for such faith. Saving faith cannot rest only on the ground of raw facts—facts like Christ lived a perfect life, and Jesus is the Messiah, and Christ died for sinners, and Christ is God, and Christ rose from the dead. The devil believes all those facts. The nature of saving faith demands more than facts as a ground—not less, but more. We have seen that saving faith is not the mere receiving of facts. It is the receiving of Christ as infinitely glorious, and wondrously beautiful, and supremely valuable. Therefore, the ground of such faith must be the spiritual sight of such glory and beauty and value. This sight is not separate from the narration of historical gospel facts. We must tell the old, old story. But the sight of Christ’s divine glory in the gospel is not identical with seeing the facts of the gospel. Therefore, human reason—the use of the mind to explain and defend the facts of the gospel—plays an indispensable, but not the decisive, role in the awakening and establishing of saving faith. We must tell the story and get the gospel facts and the doctrine right. But the decisive ground of saving faith is the glory of Christ seen in the gospel. Verse 4 says that the gospel is the “gospel of the glory of Christ, who is the image of God.” This is what must be seen for saving faith to respond to the gospel and receive Christ for who he really is—infinitely glorious. Jonathan Edwards commented on this text to the same effect. He said, “Nothing can be more evident, than that a saving belief of the gospel is here spoken of . . . as arising from the mind’s being enlightened to behold the divine glory of the things it exhibits.”4 In other words, the ground of saving faith is the glory of Christ seen in the gospel. Verse 5 makes plain that the sight of this “distinguishing, evidential excellency”—the glory of Christ in the gospel—is not seen in a vision or a dream or a whispered word from the Holy Spirit. It is seen in the biblical story of Christ as the inspired apostle preaches the gospel of Christ. Verse 5: “What we proclaim is not ourselves, but Jesus Christ as Lord, with ourselves as your servants for Jesus; sake.” Here is the place of reason. Paul uses his mind to proclaim and explain and defend and confirm the facts of the gospel. He argues that Jesus is the Christ and that he rose from the dead and that he died for our sins. He does the sort of thing we read in the book of Romans and Galatians and Ephesians and Colossians. He reasons with facts and arguments and sets Christ forth. Therefore, we know that the sight of the self-authenticating glory of Christ is not separate from the rational presentation and demonstration of the truth of the gospel. That is indispensable. But now the decisive change happens in verse 6. God, who speaks and causes light to happen, opens our blind eyes, and amazingly the gospel of Christ crucified and risen (and rationally set forth in preaching and teaching) is now radiant with “ineffable, distinguishing, evidential excellency”—with the glory of God in the face of Christ. The glory of Christ seen in the gospel is the decisive ground of saving faith6 because saving faith is the receiving of Christ as infinitely glorious and supremely valuable. It cannot be grounded on anything less. So yes, we must use our minds. We must exercise our reason in the proclamation and explanation and confirmation of the gospel. We must contend for the faith once delivered to the saints (Jude 3). We must be ready, like Paul, to go to prison “for the defense and confirmation of the gospel” (Philippians 1:7). 1 In his Prior Analytics Aristotle defines syllogism as: “A discourse in which, certain things having been supposed, something different from the things supposed results of necessity because these things are so.” (24b, 18–20). 2 J. Gresham Machen, What Is Faith? (Edinburgh: The Banner of Truth Trust, 1991, orig. 1925), p. 173, emphasis added. 3 Andrew Fuller, The Complete Works of Reverend Andrew Fuller, vol. I, Joseph Belcher, (Harrisonburg, Virginia: Sprinkle Publications, 1988), p. 281. “By faith we receive the benefit; but the benefit arises not from faith, but from Christ. Hence the same thing which is described in some places to faith, is in others ascribed to the obedience, death, and resurrection of Christ.” p. 282. 4 Jonathan Edwards, Treatise Concerning the Religious Affections, ed. by John E. Smith, in The Works of Jonathan Edwards, Vol. 2, (New Haven, Yale University Press, 1959), p. 298. 6 “Thus a soul may have a kind of intuitive knowledge of the divinity of the things exhibited in the gospel; not that he judges the doctrines of the gospel to be from God, without any argument or deduction at all; but it is without any long chain of arguments; the argument is but one, and the evidence direct; the mind ascends to the truth of the gospel but by one step, and that is its divine glory.” Religious Affections, pp. 298-299. 7 Religious Affections, p. 295. 8 “There is no spiritual conviction of the judgment, but what arises from an apprehension of the spiritual beauty and glory of divine things.” Religious Affections, p. 307. The Text and Audio of the message is posted here.